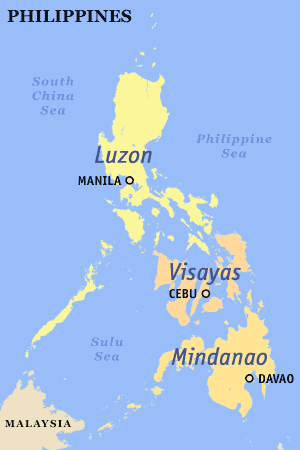 The Philippines is divided into three island groups: Luzon, the Visayas and Mindanao. Islands are organized into three distinct island group according to regions: Regions I to V, CAR, and NCR are for Luzon, Regions VI to VIII are for the Visayas, and Regions IX to XIII and ARMM are for Mindanao. If a province is reassigned into a new region, it can also be reassigned to a new island group, as is the case with Palawan, when it was reassigned to MIMAROPA. The island groups themselves do not have governments of their own, but are instead divided into provinces, cities, municipalities and barangays, which do have their own local governments. Although the island groups do not have local governments, hence capitals, certain cities have become the political, economic and cultural centers of the island groups. Manila is the national capital and is the de facto capital of Luzon, though neighbouring Quezon City, a former capital, has more inhabitants than Manila. Cebu, on the province and island of the same name, is the chief city of the Visayas. Mindanao's main city is Davao, towards its southeast. For a more comprehensive list, see List of islands of the Philippines. ^ a b Censuses of Population (1903–2007). Table 1. Population Enumerated in Various Censuses by Region: 1903 to 2007. NSO.